Our family has recently returned from a brilliant holiday in France, staying at La Bastide de Lavandieres in a small village in Languedoc called Canaules. The accommodation was lovely. We stayed in apartment 3 which is on the first floor. It has a large living/dining area with comfortable seating, modern TV with free sat, a well equipped kitchen including a good oven and hob and dishwasher. There is a double and twin bedroom with ensuites off both rooms. There is a balcony with wonderful views over the Cevennes. The balcony gets afternoon and evening sun. The apartment was clean, comfortable and well maintained. Only downside was no air con and it was very hot during our stay but there were fans. This is a small gite complex, with I think 8 units in all. The outside area is clean and well maintained. It has a beautiful salt water pool, kept spotlessly clean. There is a pool house with games and a fridge stocked with cold drinks and ice creams available at minimal cost. The pool is securely fenced off and there are strict rules to ensure safety at the pool which is reassuring for those with small children. There are plenty of sun loungers and umbrellas and loads of pool toys for the kids plus other play equipments for smaller children. The place is looked after by Gerry and Jenny , an English couple. They were almost always available on site and very friendly and helpful with loads of useful information about where to eat and interesting places to visit. They were also happy to make restaurant and activity bookings for guests if required. Canuales is a small village. Just around the corner from the accommodation was the only shop which was a general grocery and bakers. Get in early for their delicious croissants! Our favourite place to go for evening meals or supermarket shopping was Anduze which was about 15 minutes away. The area has loads to offer for all tastes - outdoor pursuits, food and wine, history, nature. Within an hour or just over you can visit Nimes, Montpellier, and Avignon and the Pont du Gard. In less than two there is the Carmargue area, Arles, Orange and Aix. In addition there are lots of nice smaller towns and villages such as Anduze, Uzes and Sommieres. I would definitely recommend this accommodation and the area and intend to stay here again in the future. The area is probably now our favourite in France and we have visited a lot of France over the years! Favourite trips were market day at St Jean du Gard (on the train from Anduze on Tuesdays), the Carmargue, the Bambouzerie ( anduze) and Uzes, particularly on market days. Avignon was a little bit further but lovely and worth the trip. There is lots to do in the area covering all interests - sports, food and wine, nature. We could go back again and have two weeks doing completely different things. Jerry and Jenny were almost always on site. They were very friendly and helpful and had a wealth of information about the local area - where to eat, where to visit, different activities etc. Although we didn't have cause to ask them to they were happy to make restaurant and activity bookings for guests. We hope to stay at La Bastide de Lavendieres again at some time in the not too distant future! We've just returned from our week at La Bastide des Lavandieres where we had a lovely relaxing time. We would like to thank you for the bottle of champagne which Jenny & Gerry gave us on our Silver Wedding Anniversary from you all. It was a lovely gesture and we enjoyed it very much. We must say that you have a couple of gems in Jenny & Gerry. They made us feel so welcome - it was as if we'd gone to stay at a friend's house, the atmosphere was so relaxed yet organised. We had a couple of small issues in Apartment 6 which they dealt with while we were out for the day and everything was as we'd requested. We will definitely recommend La Bastide to our friends and wish you good luck with bookings in the current economic climate. With our thanks and best wishes . Thanks very much for all your very kind help whilst we stayed at La Bastide, It is safe to say you went a long way to making our holiday the success it was. 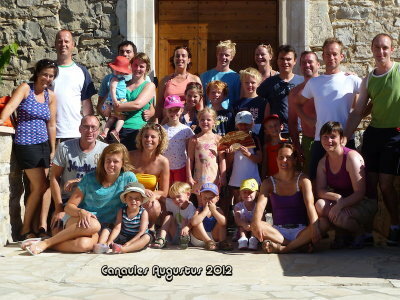 We had a fabulous time whilst there and are hoping to return next summer. We are still enjoying the fantastic rosé wine you suggested (Tornac) and so now are our friends. We finally got home after 3 hire cars . Our car has just got back into the country and has been scheduled for repair in 2 weeks. We are now driving around in our 4th hire car. (hoping this is the last one). We have started the insurance claim and it turns out that one of the drivers was un-insured and he is trying to say that his wife was driving. Beautifully restored house in a quiet village - just what we had hoped for. Our apartment had a very pleasant view and we enjoyed very much eating on the balcony in the mornings and evenings. The apartment was very comfortable for four people and the kitchen well equipped and clean, like the rest of the apartment. This is the right place for a family or couple who are looking for something special. Wonderful caretakers who make the guests feel very welcome from the first minute on and were very accommodating, friendly and well informed. They gave us (including our dog) the feeling that they enjoyed having us there which put everyone at ease and facilitated the transition into vacation life. The pictures are not deceiving: it is indeed as fantastic as it looks! We absolutely loved our stay at La Bastide. The apartment was nice and clean, simply decorated (not all that tat that you often get when you stay somewhere) and safe for our very curious 15-month old. We thought that La Bastide is a stunning building with gorgeous well-kept gardens. There were plenty of toys for our little one to play with and we loved to be able to go out on the bike with her on the back too. The swimming pool is a good size and is kept very clean. It was also really useful for us to have the little bar by the swimming pool as our daughter would always have a fair amount of shade to play in. The local area is stunning and there are plenty of things to do; you just wouldn't get bored. The new caretakers Jenny and Gerry are very kind and extremely thoughtful. Thank you very much to both of them for making our time at La Bastide so very special! They're absolutely brilliant! . They show that they genuinely care that you have a good time and are incredibly thoughtful but at the same time respect your privacy. For example, they had noticed that our daughter was a bit scared of being in the pool, even with the inflatable ring on, so the next day they had bought a little blow-up boat for her so that she could be in the pool anyway. We thought this was so kind! we felt very comfortable using their babysitting services and we had a lovely well-deserved night out. They also served us an incredible breakfast on our first morning there and we felt so spoiled. Basically, if you had any questions you could just ask but they also actively made sure to look after you and kept the place clean and tidy. The Bastide is a fantastic place in a beautiful location. We would definitely consider coming back. The welcome we received from Jenny and Gerry made the place feel immediately warm and friendly. The apartment was equipped with everything we might need - even bikes! It's an impressive building - especially the curved stone ceilings. It had a lovely homely feel that made us all comfortable and relaxed. The place was spotless, the pool beautiful and all of the open space was great and well looked after. Beautiful apartments and brilliant hosts who even helped us get a few stranded people to the airport too ! . I would definitely recommend La Bastide des Lavandieres to anyone! The week we spent at La Bastide des Lavandieres was one of the best of our 6 week trip through France. We wished we could have spent longer. The apartment was very modern and had everything you needed. The pool was an added bonus that we enjoyed every day. The pool house was great and we enjoyed many a beverage there with other guests and the caretakers. I wouldn't hesitate in recommending this accommodation . It was everything we could have hoped for . I only wish we didn't live so far away in Australia so we could come back sooner. The caretakers, Jenny and Gerry were fantastic. They greeted us on arrival and were so friendly and helpful. The kids loved their little dog Ted and played with him heaps. We enjoyed spending time with Gerry and Jenny and had drinks by the pool, dinner at a lovely restaurant nearby and also wine tasting at the owner's vineyards. Gerry also accompanied us to the doctors when my little boy got sick and translated for us. He then helped with the medicine dosage too. This went above and beyond and demonstrates what caring people they are. They are brilliant! Our kids had a ball in the pool and we enjoyed the relaxing atmosphere. I wish we could come back sooner!